This article ran in a special section of the Wall Street Journal published on March 13, 2019. China has emerged over the past decade as a powerhouse for renewable energy. Although coal remains the dominant fuel in its power sector — the country still adds three new coal plants every month — China is now home to the world’s largest renewable power fleet, with one-third of global renewable capacity. Last year, China added 44 gigawatts (GW) of solar photovoltaic (PV) and 21 GW of wind capacity, accounting for half of the world’s total additions for both technologies, double the capacity of the new coal plants it built. China’s renewable fleet generates enough electricity today to power Germany, the world’s fourth largest economy. Yet only 10 years ago China had almost no PV projects and only a few thousand wind turbines, 80 percent of which were manufactured by foreign suppliers. How has it become the world leader in renewables deployment in such a short time? The drive started in the run-up to the 2008 Beijing Summer Games, which put air pollution in the capital and other Chinese cities in the global spotlight. But renewables were much more costly than coal, which accounted for 80 percent of the country’s power generation in 2008 (and 65 percent today). The Chinese government recognized that renewables’ generation cost is primarily driven by upfront capital expenditure (capex) — equipment and construction. A typical Chinese coal-fired power plant’s cost of generation today is about $45 per megawatt hour (MWh). Fuel accounts for 60 percent, capex 25 percent. For wind and solar PV, in comparison, capex accounts for 85-90 percent of the cost. To make renewables competitive, the main task was to reduce capex. One lesson China learned in becoming a manufacturing superpower was that mass-producing a standardized product with full supply-chain support would result in economies of scale and rapid cost reductions. To get to such scale in renewables, higher demand would be needed. Authorities issued policies to spur renewable energy investment and development, starting first with wind power. Binding targets were placed in the country’s five-year plans, and provincial authorities devised preferential fiscal policies for renewables. In 2009, Beijing introduced feed-in tariffs (FiT) for wind power. Over the next decade, capacity grew twentyfold. This encouraged many more Chinese turbine manufacturers to enter the market. In 2006, only seven turbine suppliers sold equipment in China, and only one was a Chinese company. As the market grew, many new players entered, reaching 50 at one point. Competition forced the weak to exit the market. Today, 15 companies sell wind turbines in China, with the top five — all Chinese — accounting for 75 percent of domestic sales. Solar power development came later, but its growth was faster, partly because Chinese solar panel manufacturers had already been supplying the global market. Beijing announced FiT for utility scale solar PV in 2011, and in two years, installed PV capacity in China had grown sevenfold to 15 gigawatts (GW), the second largest in the world. The government then announced distributed PV incentives to encourage businesses and households to install solar panels on rooftops. In 2018, half of the country’s new PV plants were distributed projects. These policies worked so well that China surpassed Germany and now has the largest installed base of solar PV generation capacity in the world. Today, there are 200-300 solar module manufacturers in the country. A “Made-in-China” solar PV supply chain emerged, as had occurred in prior decades for home appliances and electronic gadgets. As wind and solar costs went down, the Chinese government began to lower incentives. Between 2009 and 2018, Beijing reduced wind power FiT by as much as 22 percent, with the aim that tariffs would reach parity with coal plants by 2020. It also cut the FiT for utility-scale solar projects by 40-56 percent between 2011 and 2018. This placed pressure on equipment suppliers to continue making technological improvements and cut costs. Solar PV system and component manufacturing is increasingly a commodity business, where price is the dominant differentiator. Since the PV market is global, dramatic cost reductions in China are bringing down global prices for PV components, allowing many more countries to afford solar power. IHS Markit projects that renewable technologies have room for further improvement. We expect additional declines in costs for both solar and wind. This rapid growth of China’s renewable capacity has also created challenges. Wind and solar resource-rich regions are often in the western part of China, which has less local power demand, and this has led to low renewable utilization hours. Grid companies have complained about lack of transmission coordination from developers, leaving many projects queuing for connection for months. Load centers are often far away, and regional governments prefer to prioritize local generators over renewables from afar. These have led to high levels of curtailment — involuntary reductions in generators’ output from what could otherwise be produced. During the years of the most aggressive capacity expansion, 2016-17, wind and solar curtailment rates in China reached 21 percent and 12 percent. 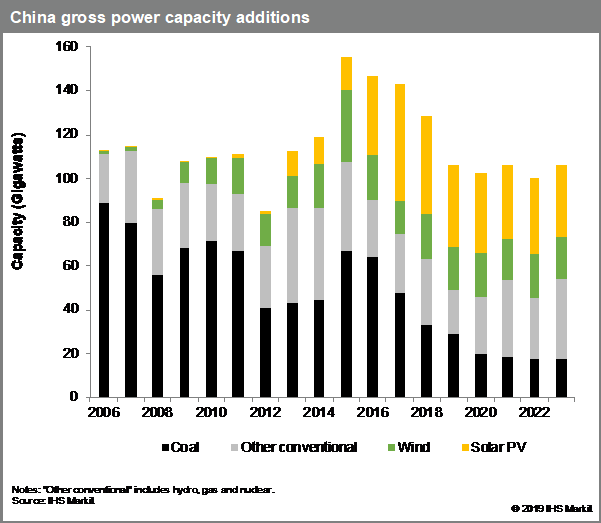 In response, the Chinese government’s priority has shifted from capacity expansion to curtailment improvement. The new policy focus is on “digesting” renewable power capacity. Authorities even put a ceiling on distributed solar projects in 2018. They also instituted renewable portfolio standards, mandating that provincial utilities include certain percentages of renewables in their mix. The goal was to encourage companies and local governments to increase utilization of their renewable fleets, which would in turn lower the average cost of generation. Such policy adjustments are not new; indeed, they reflect the “crossing the river by touching the stones” approach Deng Xiaoping introduced to Chinese reforms starting in 1978. The Chinese government sees renewables as a strategic sector, with clean energy featured prominently in the flagship “Made in China 2025” initiative. The next frontier will be batteries and energy storage — the missing pieces in the renewable intermittency puzzle. Beijing hopes to use the “Made in China” model to bring down costs in that segment as well, with the aim of ensuring it remains at the forefront in clean energy. Xizhou Zhou is Managing Director for Asia Pacific Power, Gas, Coal, and Renewables and Isabella Ni is a Senior Research Analyst for Asia Power and Renewables at IHS Markit. The authors thank Eduard Sala de Vedruna and Edurne Zoco for their contributions to this article.